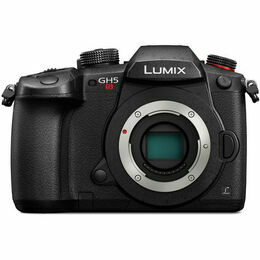 Proving that they can push the GH-series even farther into the video realm, the Panasonic Lumix DC-GH5S is a mirrorless Micro Four Thirds camera optimized for movie recording and low-light performance. Revolving around a 10.28MP Digital Live MOS sensor, DCI and UHD 4K video recording is possible at up to 60p and the large individual pixel size also affords impressive low-light performance to an extended ISO 204800, along with Dual Native ISO technology at ISO 400 and ISO 2500. Coupled with an updated Venus Engine, the sensor and processor combination also enables faster readout speeds along with 1.3x less rolling shutter distortion compared to previous GH-series cameras. Internal DCI 4K30p recording is available with 4:2:2 10-bit sampling and a full-size HDMI A connector can be used to simultaneously output to an optional external monitor or recorder. The sensor's extended sensitivity range has also been used to promote working with V-Log L and Hybrid Log Gamma HDR.